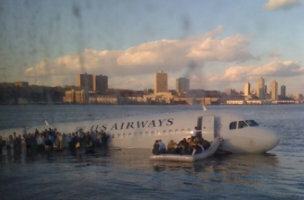 A look back at the iconic Miracle on Hudson Twitter photo. Video-based social network Viddy is sold for less than $20 million. These stories, and more, in today's Morning Social Media Newsfeed. You might not know who Janis Krums is, but chances are you saw his iconic photo of the “Miracle on the Hudson.” Krums, then 23, was on a commuter ferry rushing to rescue passengers of US Airways Flight 1549 after Captain Chesley B. “Sully” Sullenberger III gracefully landed the plane. He snapped a photo with his iPhone and posted it on Twitter. Mashable It’s been five years to the day since I took that photo, and I’ve learned so much about the platform on which I shared it. No matter who you are, if you have a message that resonates with enough people you will get noticed. NBC News “There’s a plane in the Hudson. I’m on the ferry going to pick up the people. Crazy.” Krums tweeted along with the photo. Exactly 32 minutes later, the man who first reported “The Miracle on the Hudson” was interviewed live on MSNBC. CNBC Everyone stopped what they were doing at Twitter’s office, co-founder Biz Stone recently reminisced in an answer on Q&A app Jelly. The team ran over to a computer screen to view Krums’ viral photograph, Stone wrote. USA Today The incident, which has gone into aviation lore as one of the more remarkable stories in modern aviation, captivated viewers across the USA as the rescue played out on live TV. Sullenberger went on to become something of a national celebrity in the years since the landing. Viddy, once a leading video-based social network, has been acquired after a year of struggling to compete with Twitter’s Vine and (later) Instagram video. Fullscreen, a YouTube network for brands and video creators, announced Wednesday that it had acquired Supernova — the new name Viddy had given itself in November — to bolster its mobile product offerings. Buffer’s recently launched Buffer for Business plans, enabling social media managers and digital marketers to manage and measure far-reaching social campaigns efficiently and effectively. With the integration of Google Analytics, Buffer for Business users can now match performance to specific marketing campaigns, track follower growth across multiple networks in one place and drill down into individual days to analyze the nitty-gritty of post performance. Last June, Facebook released a tracking pixel, a snippet of code that allows advertisers to track customers who come to their websites from Facebook ads. For Amy Norman, co-chief executive officer of Little Passports, the pixel was a game-changer. In related news, Facebook page administrators with iOS devices can use the social network’s Pages Manager application to perform some of their duties, but what about monitoring and managing ad campaigns? That’s where Kuhcoon Ads comes in. Skype’s growth of 54 billion minutes is a full 50 percent higher than the growth of the rest of the international calling industry combined. And as TeleGeography points out, that’s particularly impressive in light of how the market is changing. Users of Twitter apps can breathe a little easier now, as Twitter has enforced stricter security rules for app developers. Those developers who are still using HTTP connections to plug in to Twitter’s API will have up upgrade their connections to enable TLS (Transport Layer Security)/SSL (Secure Sockets Layer) encryptions, explains ZDNet.